The tour of the Sasso Caveoso and the Sasso Barisano, is a one of a kind experience, between rupestrian churches and the houses, part of them carved into the rock itself and the remaining part made with a local stone named “tufo”. We will visit one of the most interesting rupestrian churches San Pietro Barisano, Santa Lucia alle Malve, Santa Maria De Idris and San Giovanni in Monterone), admire the ravine from the panoramic street and see a traditional household, and how was it like, before the Second World War thanks to a typical cave house and its traditional setting. 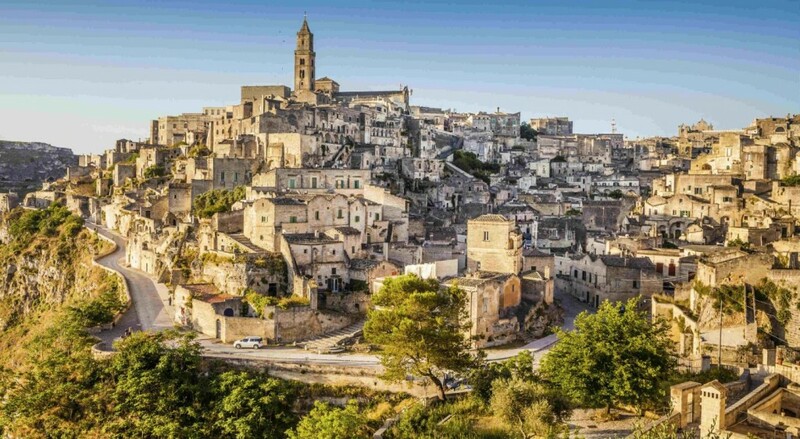 We can also visit other wards and monuments in Matera: The Matera Cathedral, in an Apulian Romanesque architectural style, Piazza Sedile, Il Piano and the baroque Buildings and churches (Chiesa del Purgatorio), Piazza Vittorio Veneto, and the medieval church of San Giovanni Battista. During our tour will be mesmerized by this one of a kind magical city of stones, that was the natural film set for Mel Gibson’s movie “THE PASSION OF THE CHRIST” and was declared “European Capital of Culture “for the 2019. It would be a pity to waste the Matera surroundings: the amazing view of the suggestive profile of the city, a visit to the “Crypt of the original Sin” with the wonderful paintings dated since the 9th century and considered the Sistine Chapel of the rupestrian churches, after that a pit stop in one of the many wine cellars so that you can taste some wine, olive oil and many others local products. For lunch we can stop to a local restaurant or if you prefer in a local bakery to taste a DOP bread or a steamy focaccia. We can modify the itinerary with a visit to other rupestrian churches or a museum (Convincino di Sant’Antonio, San Nicola dei Greci, etc,) Matera sotterranea(underground Matera) a huge and staggering underground cistern, etc .